This spring and summer you’re probably going to want to entertain. It’s only natural to take advantage of the clear skies and warm weather and have a few friends over for food and cocktails. You can enjoy any of these dishes by yourself, or with a crowd, and they are so simple that you can whip them up without a recipe, or do a quick search online and find easy-to-follow how-to’s. Mango salsa is a summer treat that can be eaten as dip or used as topping. It goes best on fish, chicken and other light meat dishes and adds a kick to grilled veggies.You can also mix mango salsa into salads and other cold dishes as well. Recently the technique of smashing burgers (as opposed to gently shaping them into a patty) has become popular. With this new trend has come a whole new world of burger recipes. Smash your burgers with your favorite veggies, herbs, and spices mixed into the meat for a delicious summer meal your guests are sure to rave about. Cucumber salad is easy to make: start by mixing chopped cucumbers, vinegar, and onions, stir well and mix with chopped dill. Once you have that down take it wherever you want! 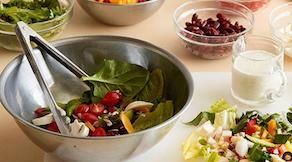 Mix in some light meats and other veggies for wholesome and delicious summer salad. Sour cherry pie is a desert with a flavor as bright and fresh as a summer afternoon. I recommend going light on the sugar to really bring out the flavor of the tart cherries. 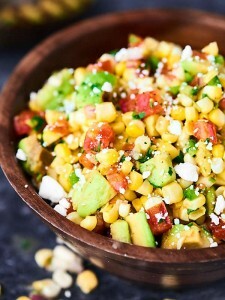 Grilled corn salsa is a savory alternative to sweeter fruit and tomato based salsas. It makes a great topping for steaks and chicken and can also be mixed into salads. Seafood tacos are great on their own, but a bit of diced pineapple can really ramp up the flavor. Simply add a bit of grilled, fried or pan-seared pineapple chunks to your tacos and see your guests faces light up as they enjoy the unexpected touch of sweetness. Galettes are a fine alternative to regular old pies and usually a little lower in calories. Blueberry galettes are great for the summer time because the blueberries are fresh and the light crust won’t weigh your stomach down on a warm day. 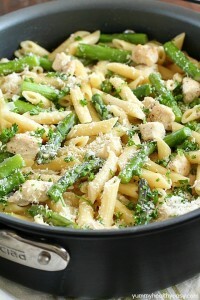 If you’re looking for something a little more substantial, then try making penne with chicken and some asparagus. It will satisfy even the heartiest appetites with fresh flavor and a serving of lean protein. 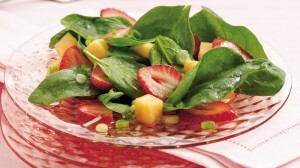 Strawberry melon salad is a versatile dish, depending on the serving it can be a side, an appetizer, or even a light meal. If you want to add an extra bit of flair to your presentation then use the hollowed watermelon rind as a bowl. Last but not least we have lemon layer cake. A light and sweet dessert that your friends and family will love. With vanilla icing and just a touch of whipped cream this cake is ideal addition to your next family bar-b que or summer picnic. The ten awesome fresh dishes for summer are certainly some of your best choices for a hot summer day. Serve any of these dishes with a cold beer or a nice cold pitcher of lemonade for the win.